Drobo and Acronis vmProtect 7 offer small and medium organisations a powerful backup solution that is fully featured, yet easy to use. The iSCSI SAN operation of the Drobo B800i lends itself to the most powerful backup and replication options and the easiest restore scenarios for VMs. Acronis vmProtect 7 offers deduplication and compression for the most efficient use of disk storage locally or across a WAN and encryption for added security. This VMware vSphere backup solutions includes robust recovery that is simple and repeatable, lets you choose among application agents vs. agentless, and provides the ability to migrate physical resources to virtual. Acronis is a leading provider of easy-to-use DR and data protection solutions in heterogeneous environments with solutions that are also cost effective. 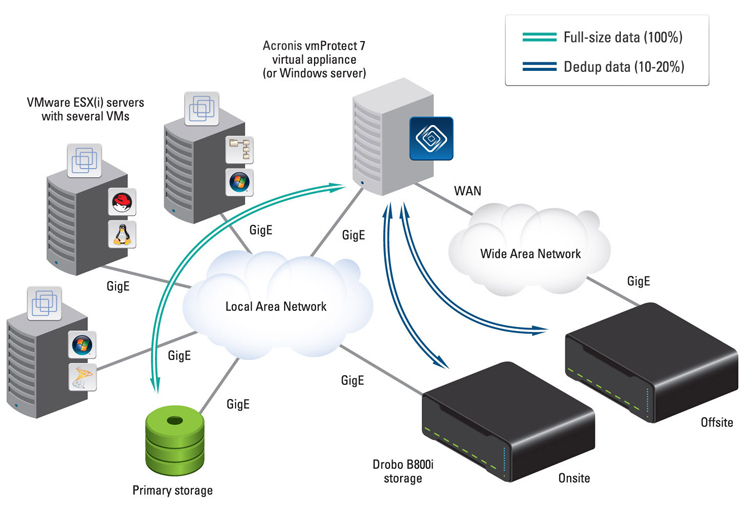 When deployed with Drobo storage, Acronis has the scale and capabilities for medium to enterprise deployments, but also offers a strong solution fit for SMBs. Studies show that small organisations are not only virtualising to achieve consolidation benefits, but they can actually go from 0% to 100% server virtualisation much faster1 than larger companies. This makes sense, since they have less data to migrate. But this change in architecture means that they also need to make changes in storage and data protection. Users expect fast backup and restore, at the same time as cost-reducing IT initiatives that mandate better levels of service without cost increases. There are many solutions that fit the budget of large organisations, but not all of those can be practical for SMBs who need lower cost and less complexity. Trying to use the same approach for VMware that was previously used for physical servers will not work. This fact, along with cost and complexity constraints for new technology, means that one third of SMBs1 do not back up their virtual servers as often as they back up physical servers. New ways of approaching VM backup, however, can change that number. New technology and architectures provide the promised flexibility of virtualisation and in the process can improve service levels and reduce complexity. Drobo and Acronis vmProtect 7 are both a great match for small and medium organisations who need a powerful backup solution that is fully featured, yet easy to use. The iSCSI SAN operation of the Drobo B800i lends itself to the most powerful backup and replication options, and the easiest possible restore scenarios for virtual machines. Acronis vmProtect offers deduplication and compression for the most efficient use of disk storage locally or across a WAN, as well as encryption for added security. With Drobo B800i, you can use additional capacity on your iSCSI SAN for other utility cases or for test and development. The solution is distinguished by its ability to protect VMware hosts and virtual machine very affordably. And while it's true that all technologies claim to have great ease-of-use, this combination of Acronis and Drobo is clearly differentiated. Data migration is another benefit of choosing a backup technology that supports changes in the infrastructure. With agentless backup, Acronis vmProtect 7 does not require agents to be installed in every VM—minimising management overhead and memory use. Plus data is read directly from Drobo iSCSI SAN storage, avoiding unnecessary load on the LAN and the ESX/ESXi hosts for other general-purpose file sharing needs in the environment. Install Drobo Dashboard on management server (can be on management server or a VM). Deploy B800i storage, easy automatic setup, configure thinly provisioned volumes. Install Acronis vmProtect 7 using the simple installation wizard. Launch Acronis vmProtect 7 from a web browser and use the Quick Start submenu to create a backup plan. Refer to Acronis vmProtect User Guide for more detail specific to options @ www.acronis.com/download/docs/abroa/userguide. Test backup and recovery, you now have VMware backup! Protecting data is important, but cost and complexity prevent small companies and departments from protecting all of their systems. The economics and ease-of-use built into Drobo make it a superior choice as backup storage for image-level backup. The Drobo B800i offers the simplest possible iSCSI SAN storage for disk-based backup and for utility uses of storage to complement other SAN primary storage. Expand storage by adding disk drives as your backup needs grow. If you can follow the colors of traffic signals, you can operate a Drobo. Drobo provides superior data protection for your backups with BeyondRAID™ technology. The B800i, an ideal fit for the on-premises backup, is also well suited as storage at a second site. It is affordable and does not require IT expertise for ongoing operations and aligns well with the dissimilar architecture enabled by Acronis vmProtect. Whether for onsite backup, offsite backup, or both, Drobo integrates seamlessly into your existing environment and enables the full potential of VMware backup with Acronis vmProtect.